a. Martha was studying either philosophy or welding. Martha was either studying philosophy, or she was studying welding. a. We have neither the money nor the desire to own a giraffe. We have neither the money, nor do we have the desire to own a giraffe. a. Good grammar will both improve your job prospects and get you more dates. Good grammar will both improve your job prospects, and you will get more dates. a. You must either read more or learn to make up facts. Either you must read more or learn to make up facts. a. Good grammar improves not only your job prospects but also your digestion. Good grammar not only improves your job prospects, but it also improves your digestion. Nouns, phrases or clauses that are joined by correlative conjunctions—both…and, not only…but (also), either…or, neither…nor—must be parallel. That means that nouns must be paired only with nouns, phrases only with phrases, and clauses only with clauses. Of the above pairs, only the a sentences follow this rule. In a. the correlative conjunctions join two nouns—philosophy and welding. In b they join a phrase—studying philosophy—and a clause—she was studying. Also parallel would be “Either Martha was studying philosophy, or she was studying welding,” joining two clauses. Remember that a clause has to have both a subject and a verb. In a. the conjunctions join two verbs phrases—improve your job prospects and get you more dates; in b they join one verb phrase and an entire clause—you will get more dates. 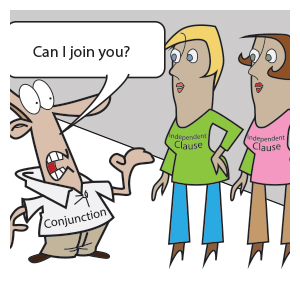 In b the conjunctions join a clause—you must read more—and a verb phrase—learn to make up facts. In b. the conjunctions join a verb phrase—improves your job prospects—and a clause—it improves your digestion.